Underwater photo service, sales and rental center. Authorized repair service for Nikon, Aquavision, Sea and Sea underwater photo equipment. Nikon Advanced Systems Dealer and manufacturer of unique photo accessories. Web magazine for underwater photographers. Includes camera equipment reviews, tips and techniques for digital underwater photography, photo-friendly dive destination reports and marine life information. New underwater garden mead just for divers with a new, better way of learning about marine life. Founded to provide a forum for the creative underwater photographer. Club offers information on underwater sports, history, records, and contacts. Light Underwater - All black & white photography featuring wrecks and underwater scenics. A selection of underwater and other photos. Fine art prints, place mats and coasters are available for the underwater work. Underwater photos, video clips and trip reports from around the world but with a focus on Monterey. Specialists in underwater stills and video focussing on animal behaviour. Collection of land based photos from world wide diving sites. Stan Waterman, Jay Ireland and seven other underwater video/photo pros offer a workshop in Malaysia. Free computer wallpaper photos of fish, invertebrates and other underwater creatures, many with links to pages describing the featured animals. Contains comprehensive information specifically about underwater housings for digital cameras. Underwater photography from Amos Nachoum and Predators, Mammals and Us offering adventure travel, unique underwater photography expeditions to photograph, and whale observation. Underwater motel in Key Largo Florida. Experience a total diving environment with instruction programs for the novice and master alike. Documents an underwater mouse. Plenty of pictures and illustrations are included. Underwater Images by Perter Pinnock features galleries and published articles from South Africa, the Indian and Pacific Oceans. Publishers of books on the underwater world including scuba diving travel guides, wreck diving, technical diving and underwater photography. Collection of over 7,500 underwater photographs from Flickr users. Mary and Johns underwater pictures from Grand Cayman. We fed the stingrays and got to play with Clio the 6 foot long Moray eel. Results of Texas tournaments sanctioned by the USOA and hosted by the Houston Underwater Hockey Trust, including the Nationals 2000 and the Texas Open 2002. An educational organization devoted to diving medicine with information diving medicine, links, diving medicine textbooks and underwater photo gallery. The daily journal of life in and around water. If its around water, its in the Underwater Times. Serving Hawaiian Islands stock photography requirements with underwater and scenic images. Also features a photo gallery of underwater images of Hawaiian Sea Life. Open water dive certification and DAN instruction by Certified Scuba Instructor. Underwater video of class, pool, and open water dives as well as broadcast quality video for promotions and dive tours available. Underwater photography from around the globe. Underwater photos of the Caribbean, Red Sea, and the Mediterranean. Underwater and topside photos from around the world. 31 Moments in a living planet Underwater photography. If the business hours of Underwater Photo-Tech in may vary on holidays like Valentine’s Day, Washington’s Birthday, St. Patrick’s Day, Easter, Easter eve and Mother’s day. We display standard opening hours and price ranges in our profile site. We recommend to check out uwphoto.com/ for further information. 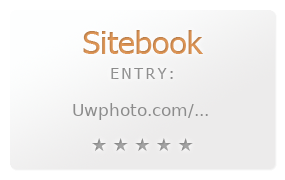 You can also search for Alternatives for uwphoto.com/ on our Review Site Sitebook.org All trademarks are the property of their respective owners. If we should delete this entry, please send us a short E-Mail.